Kim Approaching Tristan! New Drama?! Tristan Surprised By Her Behavior! 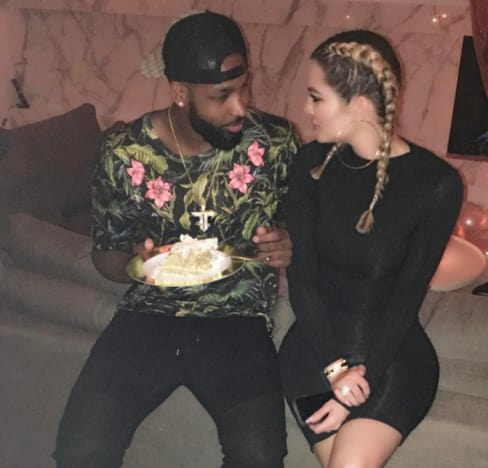 Tristan Thompson, who was caught cheating on Khloe, has been facing a tough time. Earlier, it was found that when he flew back to the native place with Khloe, he wasn't given a welcome which even sparked a big controversy. Now, when he is present in LA with the Kardashians, he is being poked by Kim this time. Read more to find how is being treated by the Kardashians. He wasn’t given a welcome by the Kardashians! When Tristan and Khloe decided to fly back to LA, it was found that Khloe and their baby were given a warm welcome by the Kardashians and Jenner. There was no mention found of him in the welcome gifts given to Khloe and their baby. It also reflects that the Kardashians haven’t forgotten the cheating scandal yet. How Khloe is making life hard for Tristan! No wonder, after the cheating scandal, he is been restricted by Khloe for almost everything. Which also says that Khloe is short of trust on Tristan. Cleveland Cavaliers player thinks that his baby momma has gained a control on him. Tristan must be fed up with Khloe! Tristan after being controlled by Khloe must be fed up with her restrictions on almost his every activity. “Tristan’s on a tightrope. Khloé’s stifling him and won’t let him out of her sight. They do everything together: eat, work out, sit in front of the TV, rest, the works,” the insider says. “He gets an hour to himself when Khloé rests with True and sneaks away to FaceTime Lani. Tristan complains to Lani about Khloe! Tristan after facing so many restrictions has complained to Lani that he is no longer interested to stay in LA and wants to return back to Cleveland with Khloe. He even said that Khloe is gaining a lot of control over him by not offering him space. Kim trying to rebuild her relationship with Tristan! Kim, who was present celebrating Khloe’s birthday, was seen rebuilding her relationship with Tristan – well, their social media at least. While mentioning how Tristan blocked her on Instagram, she wrote, “All right guys, what do you think? It’s Khloé’s birthday, should I ask this guy to unblock me?” she asked, revealing to all of her fans that Thompson, 27, had blocked the TV reality star on Instagram in the wake of his cheating scandal. The latest picture of them! While everyone was busy celebrating birthday she got unblocked! While everyone was busy celebrating the birthday, she took Tristan’s phone and unblocked her from his Instagram handle. Even Tristan didn’t mind unblocking her at least for Khloe’s birthday. So, all well between Tristan and Kardashians now? Hidden Secrets Over Natalie Woods’ Life Revealed!